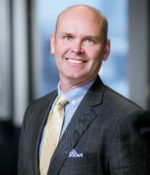 Andrew Fuller is Assistant Vice President, Domestic overseeing the Sales and Marketing activities for CN’s Domestic Intermodal segment with operations across Canada, United States and Mexico generating over $1.1B in annual revenue. Over his 25 years in the Rail industry Andrew has developed a passion for coaching a strong team of professionals and working with clients from a diverse group of industries including retail, trucking, food and beverage and forest products. Success is driven by working with new clients to offer innovative ways to improve supply chains, reduce cost and grow our shared business. Andrew holds an MBA from Concordia University and has volunteered on the board for the Food Shippers of America and within his local community.